This is a long story so please bear with me – or swiftly move on to the next page/blog/website…. Anyway the ‘eventually’ had to happen a lot sooner since one evening my voisine from downstairs knocked at the door. She had a problem with damp in the ceiling of her flat directly underneath mine and the insurance had come to look at it and pronounced the problem to be mine since the damp was presumably coming from the piping in my flat which ran across the ceiling void. Anyway, I started to put two and two together and told her that I would look into the problem. My investigation of the toilet revealed that it was permanently leaking because the clown who had replaced the flushing part had not assembled it correctly. Worse, the joint between the cistern and the bowl which are directly connected, was being made by a rubber washer. The wrong shape rubber washer. So the water that flushed into the bowl was leaking slightly every time the toilet was flushed. But when the bowl filled up and had to use the overflow, it flowed out via the rubber-washer-sealed bowl and out. Except that out should have been directly into the drain whereas it was actually directly out, down the back of the bowl and into my neighbours ceiling. OK, two evening’s work cured the problem (yes, I know I am only renting the flat but my landlord appears incapable of getting anything done. So it’s easier to apply my own technology to the task). Reported to the voisine and all was well except everything was damp so walls etc had to dry out. Next thing on the horizon is a call from Mme le Conseil who is the representative for the building of the syndicat which are responsible for the operation of the building. They are the people who arrange all of the works although the residents pay for the work and the syndicat itself I think. Any Christine called to tell me that the plumber needed to have a look at my place because there was a problem with the main cold water feed and with some leaks from the main drain pipe. Ok, no problem and I even had a civilised conversation with my landlord about it. The plumber came, viewed the peeling paint in front of the drain and where the water main came in, had a brisk and pleasant conversation and left. Many months later – probably at least 6 months, and the morning that I am due to leave for 4 weeks business and holiday, my phone rings. Yesterday evening my phone rings. OK, time to talk to the voisine….who doesn’t understand why someone wants to come and look because the plumber that the syndic always uses is doing the work. And I thought that he was coming to actually do some work. So we call M. Someone and my voisine eventually talks to him and light dawns… The syndic wants a second quote for the other work for the waste pipe even though they always use the usual plumber and the work has been approved by the residents…..
No wonder M. Someone is so keen to get in and get his quote in, and of course the other work will also require access too. And my voisine also fails to catch M. Someone’s name – which is satisfying in one sense that it isn’t just my non-French ear that failed! The logical thing of course is to knock on Christine’s door since she is the contact with the syndic. No-one there….this is the week of the vacances scolaires and everyone with kids are taking holidays ‘somewhere’. So tomorrow at 2 I have my rendez-vous with M. Someone along with a key from my voisine since she cannot be there at that time. So now everything is clear. 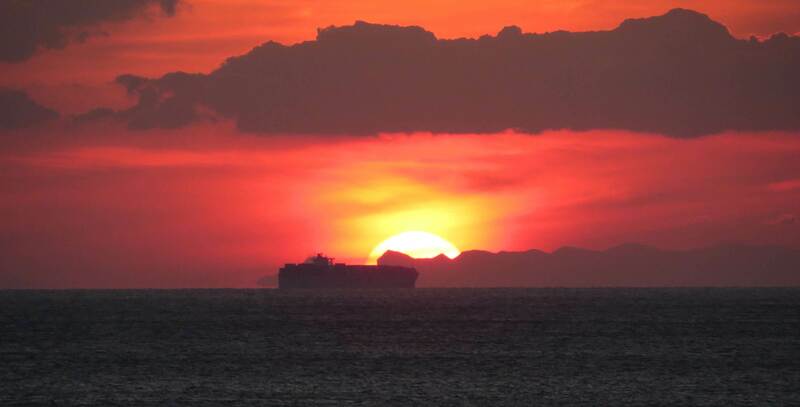 And may become clearer still tomorrow. And we may actually have 2 separate plumbers doing jobs that are physically about a metre apart from each other. On 2 seperate days. I think it is time for me to stop thinking and go to bed. 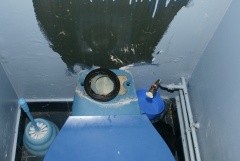 5By the way, do you know any other blogs that have pictures of semi dismantled toilets on them…? No, I thought not.